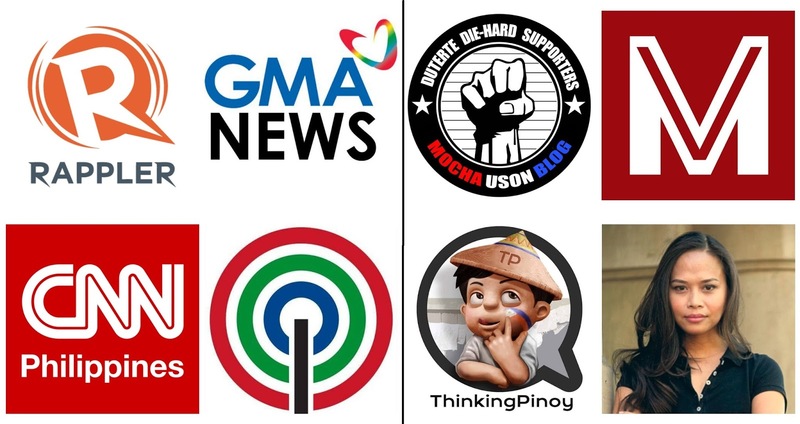 Thinking Pinoy: Mainstream vs Indie: Who’s winning the PH social media wars? Mainstream vs Indie: Who’s winning the PH social media wars? 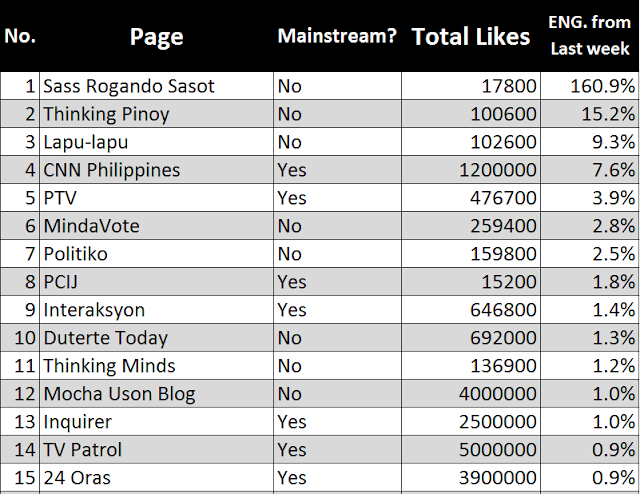 A few days ago, I posted a Facebook status update that compares Mocha Uson Blog page stats with those of the four major media outfits in the country. I was able to get the stats using Facebook Page Insights, an analytics tool that’s freely accessible by anyone who owns a Facebook page. To cut the long story short, I basically discovered that Mocha Uson is actually giving the four major networks (ABS-CBN, GMA, Inquirer, and Rappler) a run for their money in the social media game. And so, I thought, why limit it to just five? Why not learn more about the social media wars by comparing all major networks with rising independent Facebook pages? 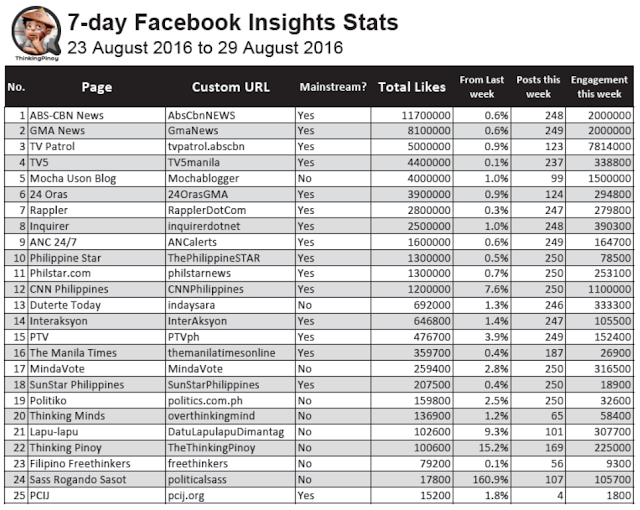 That is, who is dominating Facebook in the Philippines? And that’s what we will try to answer. As of January 2016, there are 48 million Facebook users in the Philippines. Seventy-four percent are over the age of 19. Each Filipino spends 3 hours and 42 minutes on social media every day, as opposed to 2 hours and 33 minutes on television [WeAreSocial]. These figures translate to at least 35.52 million Filipino Facebook users of voting age. Yes, Facebook has become the primary battleground for shaping public opinion. The methodology of this study is simple. I will analyze analytics data of several Facebook pages collected from Facebook Page Insights. The data used is based on the 7-day period starting from 23 August 2016. The Facebook pages included in this study are those of mainstream news outlets and several independent politics-themed Facebook pages. For this study, “mainstream news outlet” refers to pages whose content are supported by a fleet of editors and reporters, and are usually well-financed. Meanwhile, “independent” or “indie” news outlets are pages of independent bloggers, and usually work on reed-thin, often out-of-pocket budgets. Note that I included the custom URLs of each page to prevent confusing these pages with copycat or parody accounts. To visit any of these pages, just type facebook.com/ and append the corresponding custom URL. I basically discovered that Mocha Uson is actually giving the four major news outlets (ABS-CBN, GMA, Inquirer, and Rappler) a run for their money in the social media game. And so, I thought, why limit it to just five? Why not learn more about the social media wars by comparing all major networks with rising independent Facebook pages? For a given page, it appears that Facebook Page Insights calculate data from sample of the top 250 posts from the week-in-question. If a page has fewer than 250 posts, it calculates from the stats of all the posts. Now, it’s time to do some harmless number-crunching. But first, let me explain how “Facebook Influence” can be measured. Page Likes are important in helping a Facebook page gain a greater audience, the same reason why I celebrate whenever Thinking Pinoy reaches a certain number of total likes. The problem, however, is that page likes are not the be all and end all of social media practitioners. There’s another extremely important metric: engagement. Engagement refers to the total number of likes, comments, and shares. In the table in the previous section, the “engagement this week” column refers to the total number of likes, comments, and shares of the posts made during that period. The national basketball team Smart Gilas Pilipinas is extremely popular, with 2.64 million likes as of 29 August 2016. Now, let’s compare two posts. A post from yesterday showing Gilas’ international rankings raked in 2,300 post likes, 38 comments, and 22 shares, i.e. approximately 2350 engagement. Meanwhile, A post from today showing an update about Ginebra, a regular PBA team, raked in 454 likes, 21 comments, and 1 share, i.e. approximately 470 engagement. 2350 vs 470? What do the differing engagement stats mean? People liked the Smart Gilas page because they are interested in Smart Gilas. The first post gained greater engagement because it’s about Gilas while the second gained less because it’s not about Gilas. While Facebook page likes are important, engagement is more important because engagement shows how much influence a page exerts on its audience. Who needs a page with 10 million likes but has very few visitors? 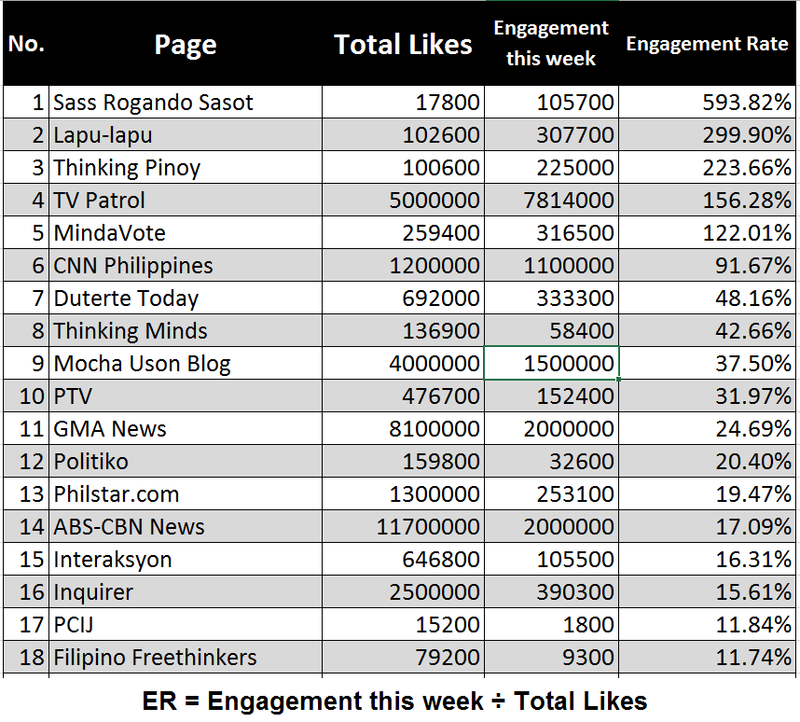 Engagement statistics is the primary point of contention in the social media wars, and this is probably the same reason why so much vitriol is being directed at blogger Mocha Uson, as stats show that she has greater engagement than most mainstream news sites. As we can see, the news giants ABS-CBN and GMANews are still on top, but it’s shocking to discover that Mocha Uson on 4th place, exceeding the respective engagement stats of CNN Philippines, Inquirer, TV5 and Rappler. 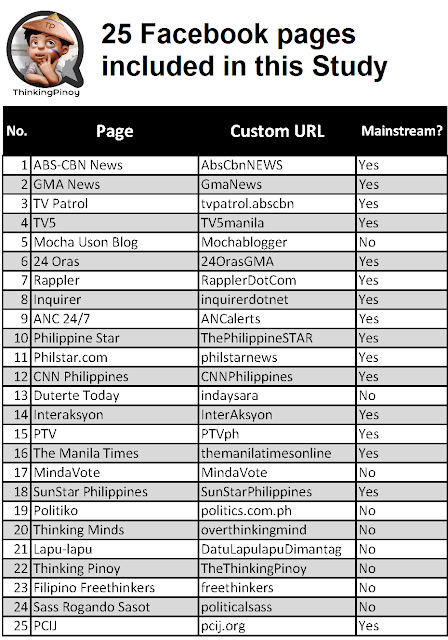 Yes, Mocha has over 400% more engagement than the college-sorority-blog-pretending-to-be-a-news-outlet Rappler.com. 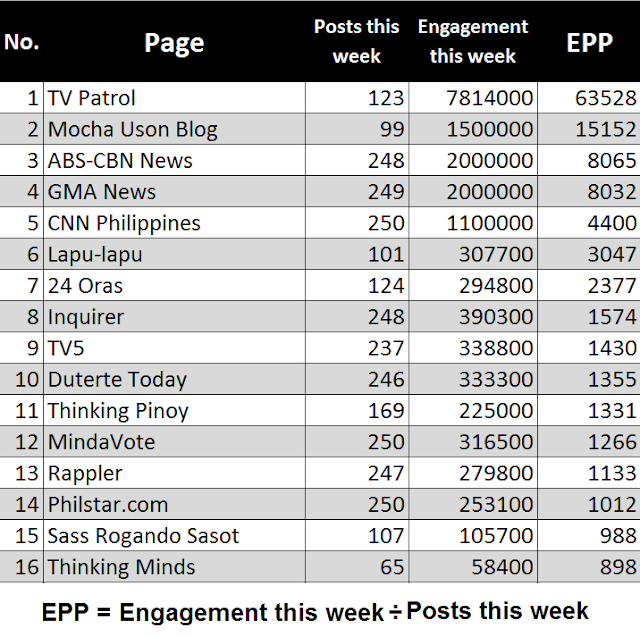 Actually, four independent pages beat Rappler in terms of engaged user this week: Mocha Uson Blog, Duterte Today, Mindavote, and Lapu-lapu. Maria Ressa and her Rapplerettes must be losing a lot of sleep lately. Personally, I also found it interesting that ThinkingPinoy, maintained by a 1-man team (c'est moi~), has higher engagement than Interaksyon, ANC 24/7, PTV, and The Manila Times. Total engagement stats are important in gauging general influence, but it’s also important to know the average effectiveness of a given page’s posts, and we measure this using the metric “engagement per post”. Engagement per post (EPP) is the measure of whether or not a page’s content is interesting enough for its audience. EPP is equal to the total number engagements divided by the total number of posts. If a page's quality is defined as the "interestingness" of posts vis-a-vis the page's audience , then those with higher EPPs post higher-quality Facebook status updates. 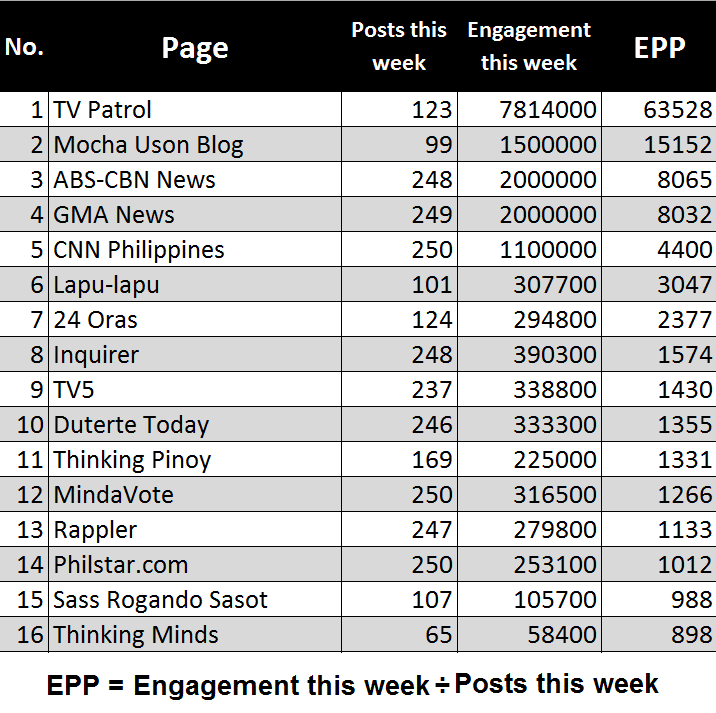 We can see that mainstream media TV show TV Patrol’s page has the highest EPP with 63,500. What’s surprising, however, is Mocha Uson Blog, whose EPP exceeds that of news giants ABS-CBN, GMA, CNN, Inquirer, and TV5. 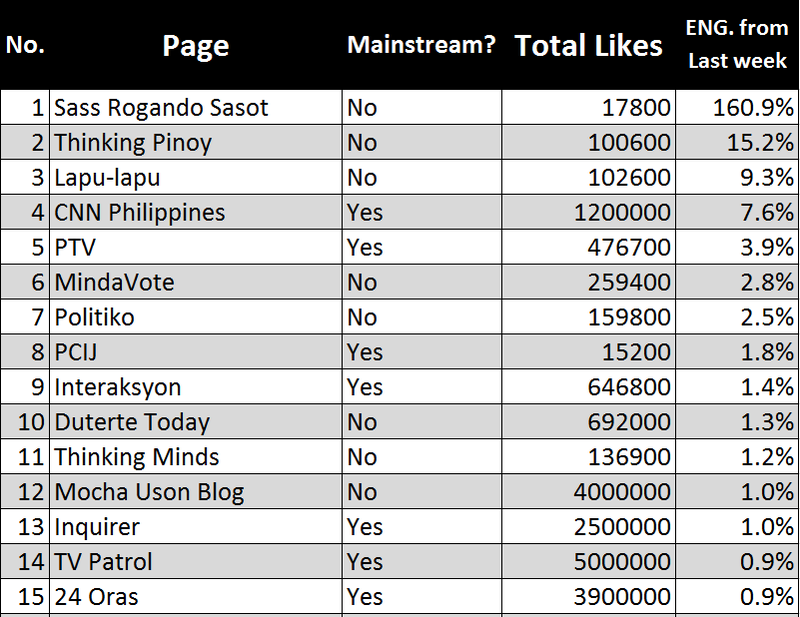 Indie pages Lapu-lapu, Duterte Today, ThinkingPinoy, and MindaVote, all of whom basically run on virtually no budget, has EPP rates that exceed Rappler, who received funding from investors like North Base Media and the Omidyar Network. The times are changing, indeed. Engagement Rate (ER) is a metric that social media marketers use to measure a brand’s effectiveness at engaging their audience. Basically, ER shows how many of your fans actually gave a damn about what you have posted. ER is typically calculated by dividing total engagements by total reach, or the total number of people who saw a page’s post [SimplyMeasured]. This formula is impossible to use in the context of this study, as Facebook reach statistics are not available in the Facebook Page Insights analytics tool. Fortunately, there is an alternative formula for engagement rates where ER equals the total number of engagement over the total number of fans (a.k.a. page likes) [SimplyMeasured]. Despite drastically lower pages likes, Indie pages occupying six slots in the top 10. That is, these pages appear to offer more compelling (i.e. more engaging) content than most of their peers. Sass Rogando Sasot, a newly-created page, has an astounding 593% engagement rate. Lapu-lapu is at 2nd with a shade below 300%, and ThinkingPinoy is 3rd with 224%. 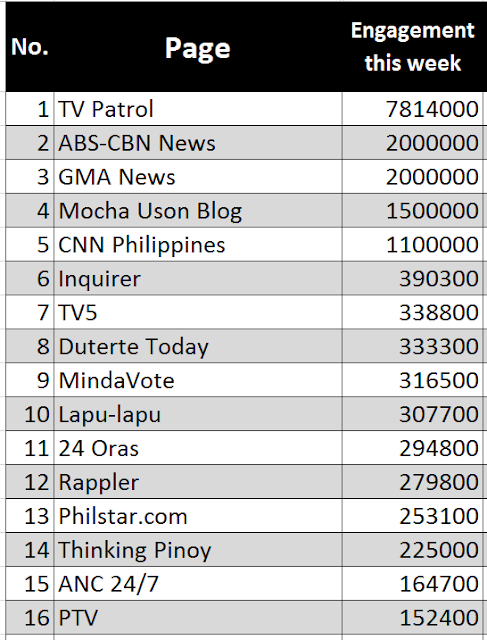 Rappler is nowhere to be found in the top 15. Engagement growth rate (EGR) can give us an idea about the growth prospects of each page. In the context of this study, Facebook's EGR is defined as the increased in engagements this week compared to last week. 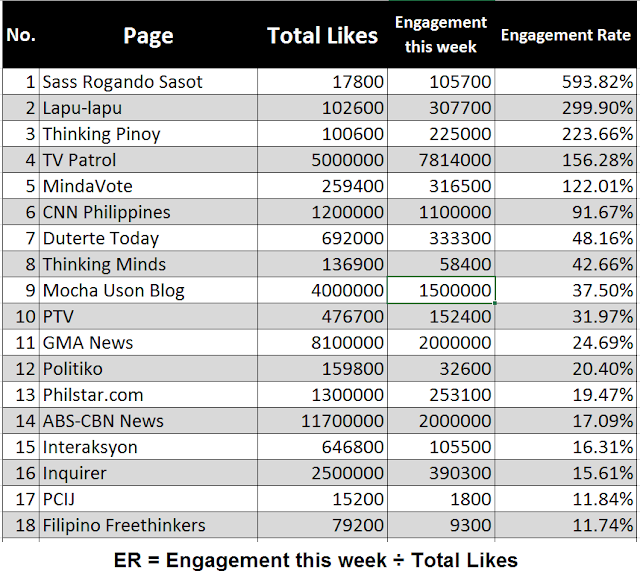 Over the past week, Sass Rogando Sasot enjoyed a whopping 161% increase in engagements. ThinkingPinoy and Lapu-lapu gained 15% and 9%, respectively. This suggests that the three pages are still growing, i.e. they may receive more page likes than the rest. Rappler, TV5, and many other major news outlets experienced less than 1% growth, suggesting that they may have already saturated their audience. Essentially, this indicates that indie pages are growing rapidly, and mainstream media is now facing the prospect of obsoletion if they do not shape up. Note, however, that the Sass Rogando Sasot page is barely a month old, while ThinkingPinoy is just 10 months old. This partly explains the growth stats, as there is still a large room for growth compared to the other pages that have been online for years. These numbers can be confusing, especially for those who hate Math.So let me give you a recap of what was discussed. First, indie pages appear to offer more engaging content compared to mainstream pages. Note, however, that this has nothing to do with the veracity or truthfulness of what they post. This is why it is important for readers to verify information before believing what's written on their posts. This is the same reason why I meticulously insert hyperlinks and citations within every post in ThinkingPinoy, so I can let my readers read the sources for themselves and come up with their own conclusions. Second, fans of indie pages are more passionate than fans of mainstream pages. Imagine this: Mocha Uson has 4 million followers and 37.5% engagement rate while ABS-CBN has 11.7 million followers and a 16% engagement rate. If there were a People Power Revolution next week, which page is more likely to convince more people to join its cause? Third, engagement numbers of indie pages are starting to rival mainstream pages. The growth of indie pages generally outpace the growth of mainstream pages, suggesting that there might come a time when these indie pages may enter the mainstream and kick today's mainstream pages to the sidelines. For mainstream media, these three conclusions are alarming vis-a-vis the 2022 presidential elections to be held six years from now. By that time, there will be 48 million Filipino Facebook users whose political opinions may be shaped primarily by independent influencers. Actually, that prediction might have already come true during the 2016 Presidential Elections where, despite the most vicious attacks from mainstream media (Remember the tasteless Trillanes-sponsored TV ad featuring kids? ), the political outsider Rodrigo Duterte still managed to win by landslide. Whether we want to admit it or not, Mocha Uson should be largely credited for Duterte's online dominance. The rise of independent pages is the rise of independent thinking, where political commentators can speak their mind more freely than those who belong to mainstream organizations. This is the first time in history that virtually any Filipino with a cheap smartphone can make his voice heard, with no editorial teams and no business interests to prevent him from doing so. Indie pages, managed by regular people, now have a voice that can influence millions of Filipinos. This is democracy at work. Aika Robredo may not not very happy with it. Ah, democracy, thou art a heartless b!tch.